Few issues rile up more people than income inequality. The distribution of wealth in America has always received attention, but after the Great Recession, the debate became louder and more public. The widening gap between the "haves" and the "have-nots" ignited social movements like Occupy Wall Street, bolstered liberal politicians like Vermont Sen. Bernie Sanders and fueled all those railing against the people atop the economic ladder. Much of the anger is directed at the "top 1 percent" -- the people who make more money than 99 percent of all other Americans. Many people envision these "1 percenters" as corporate CEOs, sitting in large offices, enjoying fat paychecks and nice clothes. Usually, the paycheck part of that image isn't far from the truth. In 2014, compensation for top CEOs averaged $16.3 million, according to the Economic Policy Institute . That's 303 times more than what the typical worker earned that year. When adjusting for inflation, CEOs have seen their earnings increase 997.2 percent since 1978. During that same time, the typical worker has only experienced a 10.9 percent increase in pay. To explore the wealth of the executives leading the business world, Graphiq's corporate research site FindTheCompany ranked the 25 CEOs who made the most money in 2015. Measuring what CEOs make isn't as easy as looking at their salary. They're paid in many other ways. Top executives are commonly compensated through restricted stock awards, which are shares of the company that become available years down the line. Other forms of compensation may include bonuses, security options and company contributions to 401(k) plans. FindTheCompany took into account all of these payment methods. The ranking is limited to those who were still serving as the company's CEO in July 2016. It's worth noting that only two women made the list -- Marissa Mayer of Yahoo and Marillyn Hewson of Lockheed Martin. That's 8 percent. But that's pretty representative of the country's top companies. Only 24 of the firms in the S&P 500 -- 4.8 percent -- are led by women. Joe Kiani , CEO of the medical technology company Masimo , topped the list, raking in $114 million last year. His salary stood at only $884,000 -- another $112 million came in the form of restricted stock awards. His overall compensation increased about 2,390 percent from 2014. Sundar Pichai , the newly minted CEO of Google, came second on the list with about $100.6 million in total compensation. This number doesn't tell the whole story though. 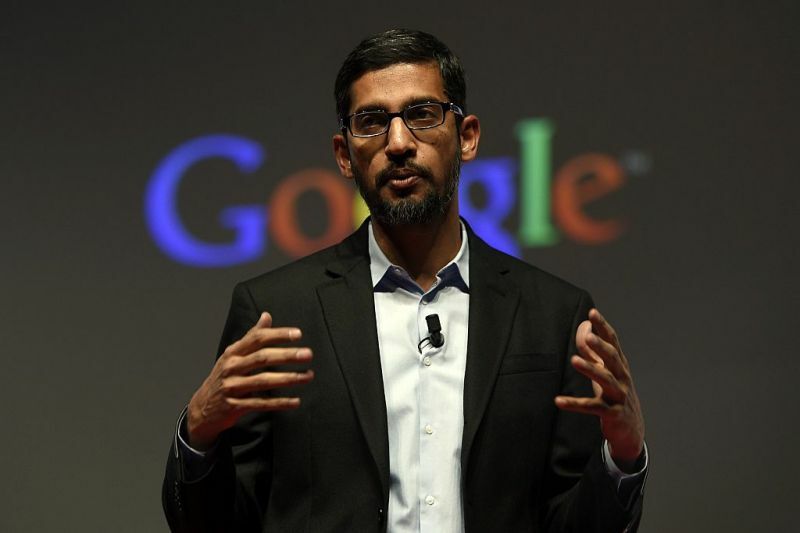 Google appointed Pichai to the CEO position in August 2015, but he didn't receive the subsequent $199 million restricted stock award until February 2016. As a result, this couldn't be counted in the ranking. It's not uncommon for such stock awards to surpass a chief executive's salary. While serving as Apple's CEO, Steve Jobs earned only $1 per year in salary. However in 2003, he received a stock award worth $75 million . In 2007, Stephen Schwarzman of Blackstone Group had an even more extreme salary-stock differential. That year he earned a salary of $175,000, but the value of his stock award exceeded $7.8 billion. His 2015 compensation of $89.5 million pales in comparison, but still earned him the third spot on FindTheCompany's list. Another interesting person to make the list was Marissa Mayer , coming in 14th place. She earned almost $36 million last year, but her company's recent $4.8 billion acquisition by Verizon could put her at risk of losing her job. Though Mayer says she intends to stay with the company as Yahoo is merged into Verizon's AOL department, it's unlikely she'll remain the firm's chief executive officer.